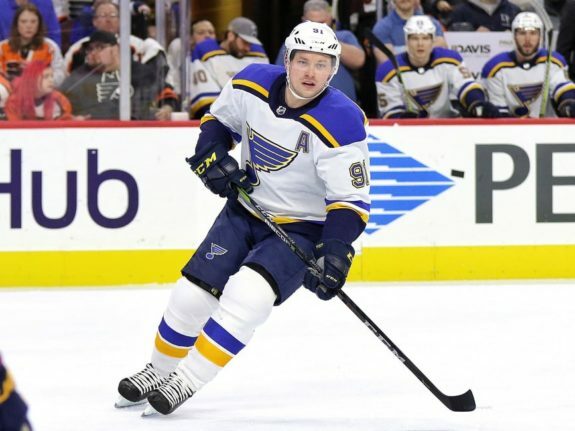 As the NHL’s Western Conference careens to its April finish, it is not always easy to figure out how your team is faring, where it projects and what is coming up next. At The Hockey Writers, we’re here to help. We’ve put together a quick and simple view of the eight teams locked in this close race. It’ll be updated on Thursday, to reflect the results of the Monday-Wednesday games, and it’ll be updated on Monday to cover the Thursday-Sunday games. In this offering, all eight teams are down to 10 games or fewer left, which means its time for the countdown. We previously conceded the Nashville Predators, Winnipeg Jets and Vegas Golden Knights are in the playoffs. We said the Edmonton Oilers, Chicago Blackhawks, Arizona Coyotes and Vancouver Canucks aren’t going to make it. None of the other eight Western Conference teams found their way onto either list. All eight teams we discussed on Thursday are still in the playoff hunt, fighting for five playoff spots. We’ll cover these eight as long as each team remains in contention. Our table indicates the points each team has and provides a projected season total, based on each team averaging one point per game in each remaining game. In our last edition (results through Wednesday, Mar. 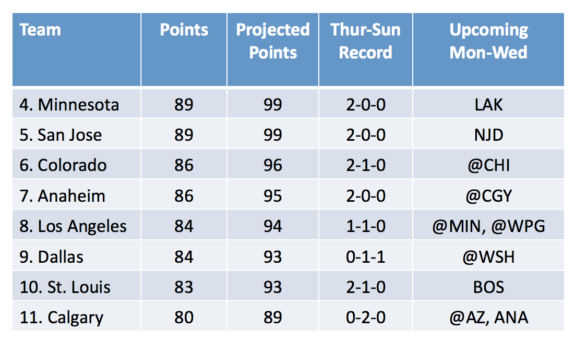 14), all eight teams projected within six points of each other. The last team in the hunt (Calgary) was a mere three points from a playoff spot, the top teams (San Jose, Minnesota) a mere four points from losing their playoff spot. This has changed, especially for Calgary. The Flames remains in the mix, but barely. They can’t afford to merely tread water at this point – they need to go on a run to stay in contention. If they fail to do so in their next few games, they’ll be dropped from the group of contenders. In Colorado’s 4-1 win on Thursday over St. Louis, Avalanche goalie Semion Varlamov stopped 44 of 45 shots on goal, including all 22 in the third period. He followed it up by stopping 37 of 38 in the Avs win over Detroit on Sunday. 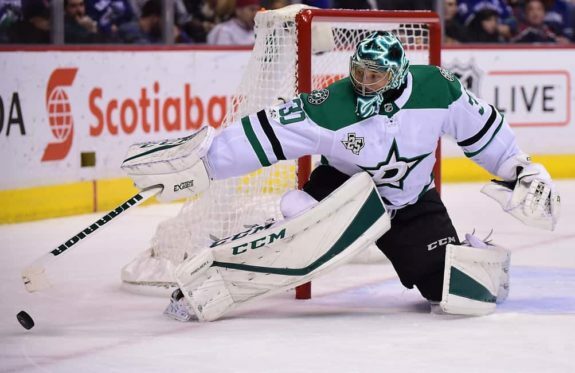 It was a disappointing overtime loss for the Stars against Ottawa on Friday, but at least goalie Ben Bishop returned after a five-game absence. Alas, Bishop’s return was short-lived. He left the Sunday game against Winnipeg with an injury and early reports suggest he’ll miss most, if not all, of the remainder of the regular season. In the Sharks’ 7-4 win over Calgary on Friday, Evander Kane posted his first career hat trick and finished the game with four goals. In the game, Calgary was down three with over six minutes left when head coach Glen Gulutzan pulled his goalie. With their net empty, the Flames scored to cut the deficit to two. A few minutes later, Gulutzan repeated the tactic but had the opposite result when the Sharks scored an empty net goal to seal the game. On Saturday, New Jersey Devils goalie Keith Kinkaid pitched his first shutout of this season, against the Los Angeles Kings. Kinkaid now has four career shutouts, two against the Kings. The Sharks completed their road trip against Vancouver with a win on Saturday, but more injury news proved concerning. Defenseman Joakim Ryan was unable to play. In the first period, Melker Karlsson went down with an injury, making him the fourth Sharks forward who is hurting. In the second period, defenseman Marc-Edouard Vlasic, perhaps the team’s most important player, took a hard shot and missed the rest of the game. St. Louis pulled off a critical overtime win over the New York Rangers, but like the Sharks, had an unwelcome injury to a star player. Vladimir Taresenko left the game late in the first period with an upper-body injury. He missed the Blues come-from-behind overtime win on Sunday against Chicago. The Blues have 10 games remaining and, on paper, the easiest schedule of the eight teams. They play four games against teams which won’t make the playoffs. Of course, two of the four are against the Chicago Blackhawks. The Blackhawks don’t have a ton to play for, so ruining the season of a hated rival has to be a strong motivation. Anaheim defenseman Josh Manson left Sunday’s game against New Jersey. His injury, if he has to miss much time, is problematic in light of the surgery to fellow defenseman Kevin Bieksa. Bieksa underwent hand surgery earlier in the week and will be out several weeks. Calgary’s uphill battle might come without defenseman TJ Brodie, who left the game against Vegas on Sunday after taking a big hit from Ryan Reaves. There are plenty of games where the eight teams will go head-to-head, with a potential four-point swing. Six of the eight teams have at least five of these games left on their schedule (St. Louis and Calgary are the exceptions). We’ll let you know what happened the previous few days and what to look for in the days ahead.